On the Italian foodie blogs I follow, everyone is turning over to cold food because of the hot weather. When we have hot weather here we still eat hot food — we just prepare it outside on the grill (which we call barbecue). This is to celebrate having hot weather, which doesn’t happen too often. The grills used here are mostly charcoal or briquettes, although gas grills are becoming more popular. Although they are more easy to use, they do not become hot enough and they do not add the characteristic smoky smell. Charcoal is best. A Dutch barbecue meal usually means lots of cheap meat with lots of sauces to cover the (lack of) flavor of the meat. This is a shame, because there are so many nice things you can prepare on a charcoal fire. Like these shrimp for instance. Many friends and coworkers who read my blog comment that my recipes are always so difficult and complicated. That is certainly not true in this case. There are no complicated ingredients or tasks to perform. Simply combine jumbo shrimp (which you can buy peeled and deveined, although of course buying them fresh and peeling them yourself will give better results — but even I did not do that in this case) with the ingredients for the marinade, allow to marinate for half an hour, and then quickly grill over high heat on both sides. Just don’t overcook the shrimp, and don’t forget to remove the garlic before grilling (as it would brown and become bitter). This recipe is simple, but it is also delicious. 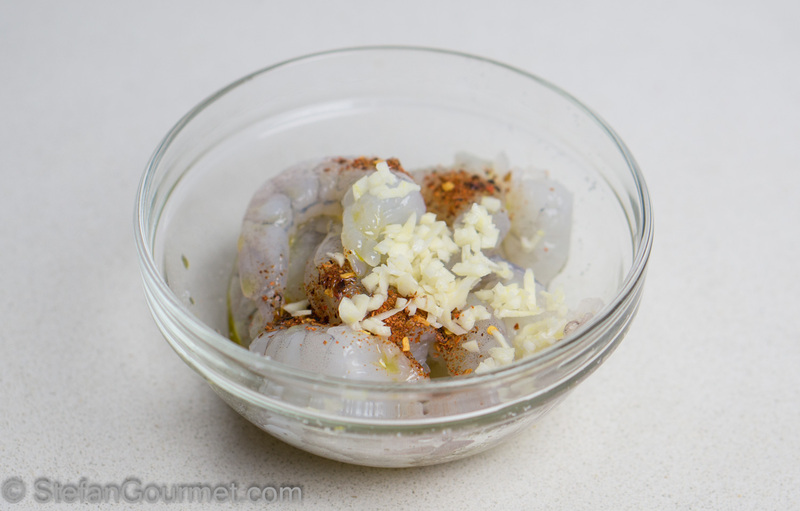 The simple marinade of salt, garlic and chili flakes really brings out the flavor of the shrimp. 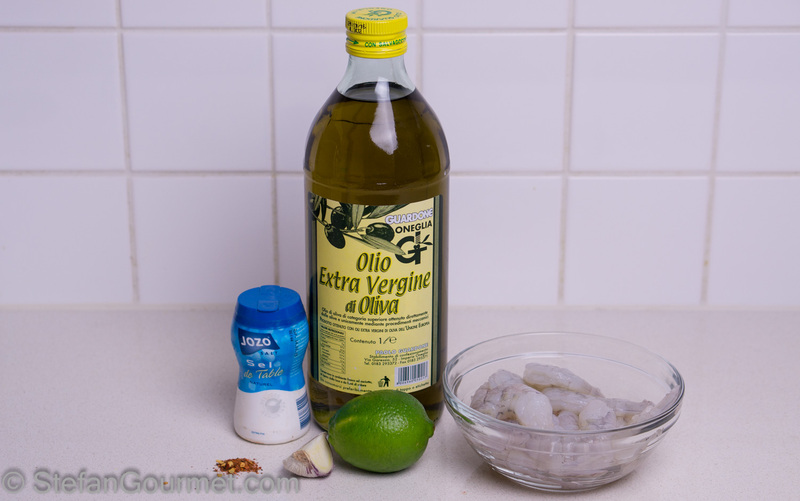 The lime juice is only added at the end to avoid inadvertently making ceviche instead (as the shrimp would otherwise be ‘cooked’ in the lime juice). I’m providing the recipe for 225 grams (1/2 lb) of jumbo shrimp, but you can easily scale it to the amount of shrimp you need. Rinse the shrimp in cold water and pat dry with paper towels. Put them in a bowl. 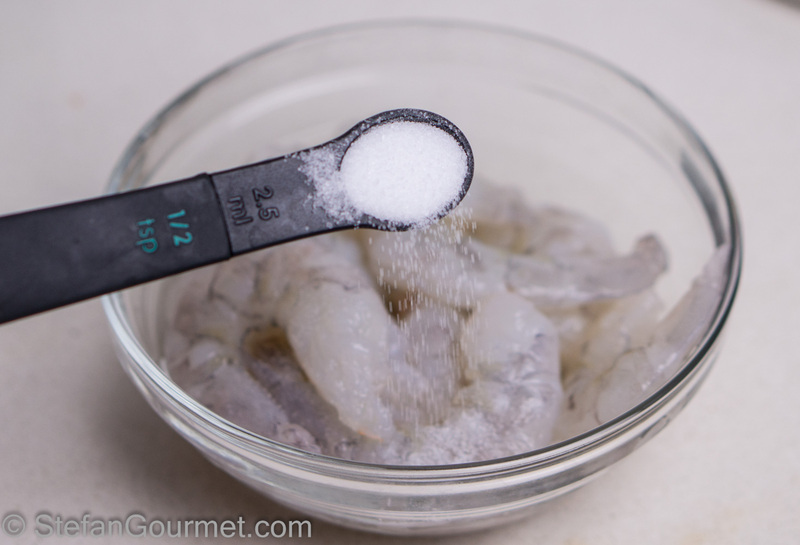 Add 1/2 tsp of salt for every 225 grams (1/2 lb) of shrimp. Add 1/4 tsp of chili flakes for every 225 grams (1/2 lb) of shrimp. 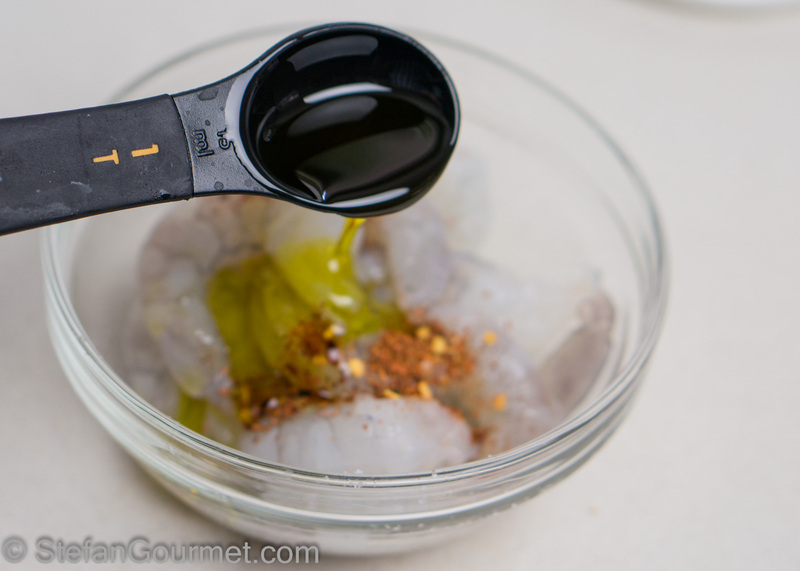 Add 1 Tbsp of extra virgin olive oil for every 225 grams (1/2 lb) of shrimp. Add a minced clove of garlic for every 225 grams (1/2 lb) of shrimp. 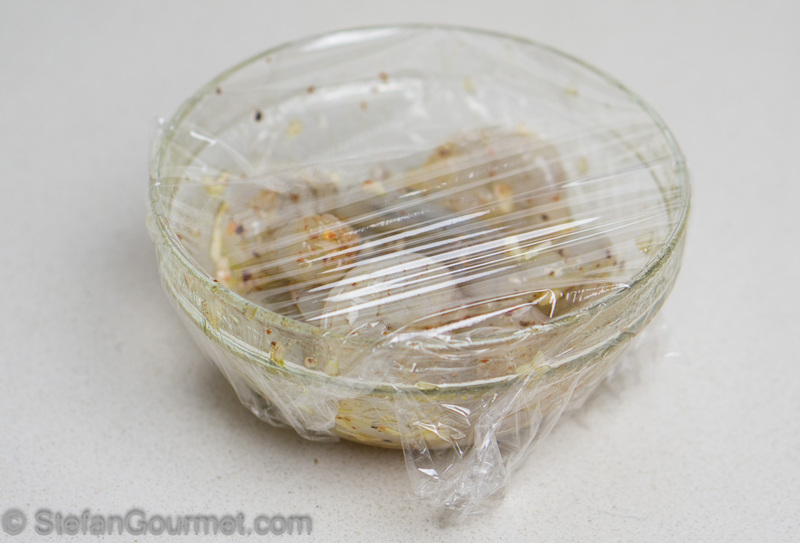 Stir until mixed well, cover with plastic wrap, and refrigerate for at least half an hour or up to 8 hours or so. 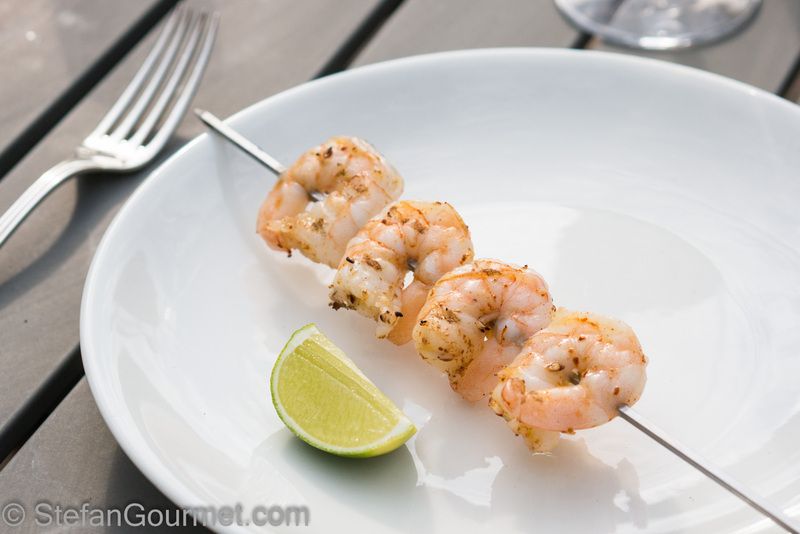 Remove the garlic with your fingers or a paper towel and put the shrimp on skewers. I like to use metal skewers as they won’t burn and can be recycled. 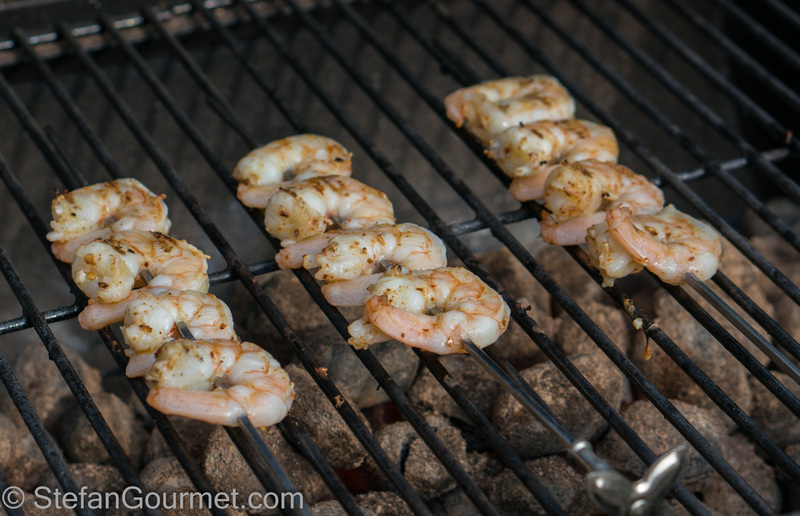 When the grill (barbecue) is hot and the rack is clean, grill the skewers with shrimp for 30 seconds on each side, and repeat to grill for another 30 seconds on each side. After about 2 minutes of total cooking time, the shrimp should now be golden on both sides and cooked through. Do not overcook the shrimp. Serve at once, with a lime wedge. This is great with many crispy dry whites, like a nice sauvignon blanc. It’s winter here in New Zealand and pretty cold today. Not BBQ grilling weather at all. I love that you mostly use charcoal with gas being more popular. Here it is the other way around. Gas is more popular but there is a trend towards charcoal as the flavour is better. Your shrimp look wonderful I like the idea of cooking these on the grill first and snacking on them as a starter while the other things are cooking. Yup, that’s exactly what we did as they cook so quickly. And of course it’s also better to build up from light flavors and wines to the heavier stuff like red meat. I remember in NZ we couldn’t find charcoal anywhere and had to use coin-operated gas grills on campsites that didn’t become hot enough. I am ashamed to admit I use gas. Lovely shrimp. 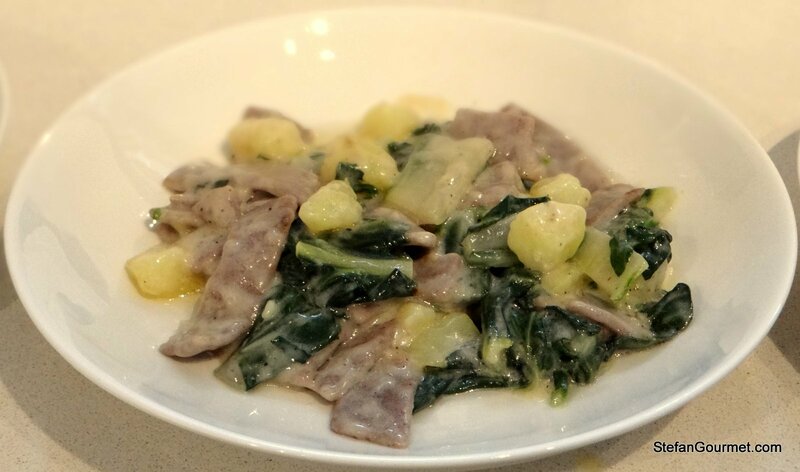 Mi piace molto questa ricetta: semplicissima e molto saporita. Apprezzo sempre marinare carne e pesce prima di cuocerli al grill. One of our favorites here, for as long as we can use the grill, and so quick to make! I usually use a combination of olive oil, lime juice and various BBQ mixed spices – comes out great. Cheers! I was actually afraid that you might ask that question. With its simplicity, this dish is hard to match with the wine. Because of the BBQ flavor combined with the pungency and crunchy texture of the shrimp, I’m a bit at loss. I would say we do need acidity, and a bit of sapidity, so I would probably go with earthy Provence Rosé as my top choice, but I think any medium bodied Rosé with good acidic backbone would work quite well here. I’ve had good results pairing this with a richer style Grüner veltliner (from Alte Reben/old vines) and sauvignon blanc, but I’ve never tried it yet with rosé. That is a good idea that I will try next time I prepare these shrimp. My white pairings were more based on the lime and chile than on the earthiness of the shrimp. 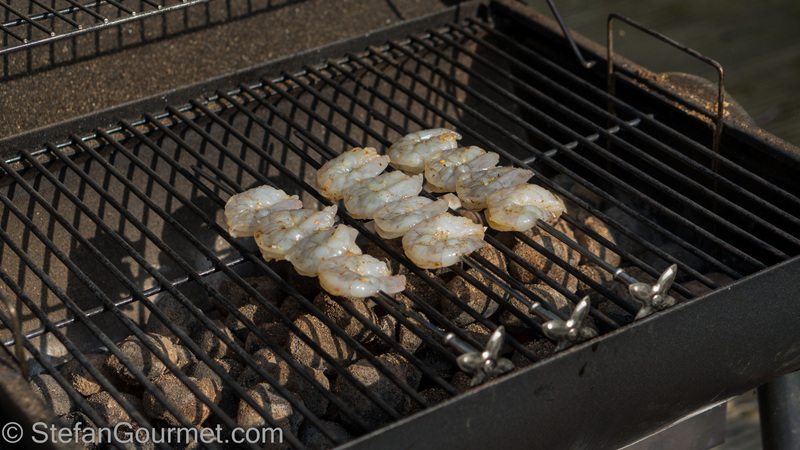 Shrimps on the BBQ are a favorite appetizer in this house when there is company. Gas versus charcoal? I have both but gas is my ‘turn to’ every time. And it sure gets hot! Just exactly how I like to prepare my shrimp. Charcoal grills are the best! Have never found your recipes difficult compared to many on posts! Lovely prawn recipe . . .’tis winter here but a proper grill/griddle pan over the stovetop surely takes care of that!! Now the doctor/dietician in me comes out: YOUR choice – eat charcoal cooked and heavily increase your Ca risk, cook away from the delicious smoke: the browning of anything is still not on the healthy side but gas grills are much safer! One’s own choice 🙂 !! Come al solito un piatto coi fiocchi! My husband is a barbeque snob and will only use charcoal! And I’m glad! 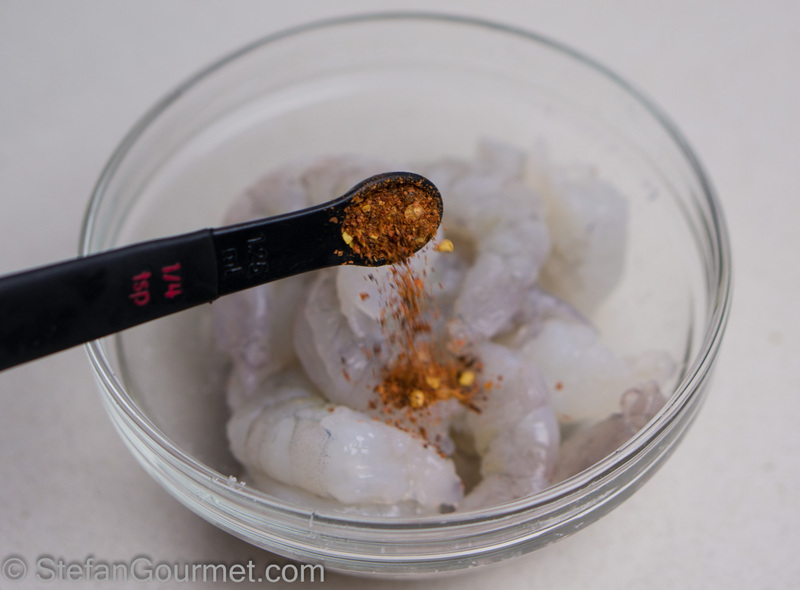 Great shrimp – love the chile pepper flakes!!! Nobody can complain this isn’t easy, that’s for sure! Shrimp tastes wonderful grilled. We use a charcoal grill when we RV camp, but have a gas grill at home. I adore marinated prawns cooked this way Stefan! So quick and easy… and delicious accompanied by that glass of wine of course! Interesting to read Anatoli’s wine recommendation… A Provençal Rosé sounds wonderful! 🙂 I have a favourite from Bandol – Domaine Tempier – which is sadly near impossible to find in my part of the world. That is a very nice rosé indeed, and sold in a wine store just a block from my office.